Enterprise search technology helps in getting information 30% faster, saves employees time, and improves efficiency. The enterprise search helps in securing data by providing limited access to the information because only authorized individuals can access the data. The enterprise search technology is widely used in the BFSI industry. Rising need for better and effective search solutions and growing amount of data in organizations have also grown the demand for enterprise search solutions immensely at the global level. Enterprise search solutions also provide better layers of security, efficient management of information, and allowing access only to the authorized person. The global enterprise search market is expected to grow at a massive rate and has opened various opportunities for players contributing this market. According to the analysts, the global enterprise search market is expected to reach US$ 3.9 bn by the end of 2019. This market is estimated to expand at 12.2% of CAGR during the forecast period from 2013 to 2019. The researchers of the global enterprise search market have categorized the report on the basis of end users, the size of the enterprise, and region. Based on the end user, the market for enterprise search segment includes government and commercial offices, retail, banking and financial services, healthcare, and others (media and entertainment, aerospace and defense, construction). Out of these segments, banking and financial services hold the larger market share. Factors that are driving the growth of this market is mainly because of increasing connectivity of banks and financial offices via, internet. These services help in increasing data shared between the branches and offices and are secured from external breaches. Based on the size of the enterprise, the enterprise search is segmented into medium scale enterprise, large scale enterprise, and small scale enterprise. Among these segments, large scale enterprise is accounted to be the largest segment by holding 61% of shares in the global market. However, in the forthcoming years, medium scale enterprise is projected to be the fastest growing segment. Increased usage of internet search and data in the small and medium enterprise will also boost the demand for enterprise search solutions in the medium scale enterprise segment. Technological advancements and increasing organizational need for better search results have created the demand for enterprise search market across the globe. On the basis of geography, North America is expected to dominate the global enterprise search market. The total revenue share held by North America was 34.2% in past few years. Increasing technological advancements is the major reason for the growth of enterprise search in North America. In addition, increasing use of enterprise tools and enterprise search across various industries in countries such as Germany, France, and the United Kingdom have created growth opportunities for this market. To give a better understanding of the market, the report carries a competitive landscape in which various leading companies are analyzed such as Oracle Corporation, Coveo Solution Inc., Microsoft Corporation, IBM Corporation, and Attivio Inc.
Enterprise search is defined as the technique of making the content from databases, data management systems, intranets, emails, and others searchable to the audience. It is a type of software that helps in searching the information within an enterprise. With the continuously increasing volumes of the data generated, it has become significant to store and manage this data. With the loads of databases created every day, it is equally important to develop data retrieving tools to efficiently help in extracting the necessary information whenever required from these databases. The report includes segmentation of enterprise search market by end user, size of enterprise and geography. Further, it provides current and forecast market size by revenue for the aforementioned categories. Cross sectional analysis for end-use industry, size of enterprise and geography segments is also a part of the scope. Factors influencing and inhibiting growth of the market have been analyzed. The market overview section of the report demonstrates the market dynamics such as drivers, restraints and opportunities that influence the current status and future status of the market. Impact factors such as Porter’s five forces analysis have also been explained in the market overview section of the report, in order to give a thorough analysis of overall competitive scenario in global enterprise search market. The report includes segmentation of enterprise search market by end-use industry, size of enterprise and geography. Different end-use industry using enterprise search solutions includes government and commercial offices, banking, financial services and insurance, retail, healthcare and others (media and entertainment, aerospace and defense, construction). The market revenue and forecast for each industry has been provided for the period 2011-2019 in terms of USD million, along with the CAGR for the forecast period 2013 to 2019. Enterprises are classified on the basis number of employees in the company. The enterprises are classified into large scale enterprise, medium scale enterprise and small scale enterprise. Large scale enterprises have employee strength of more than 10,000 whereas medium scale enterprise employed between 5,000 to 10,000 employees. Small scale enterprises have less than 5,000 employees. A detailed market analysis and forecast for these types of enterprises has been provided in the study, in terms of market revenue in USD million for the period 2011 to 2019. The market revenue has been forecast for the period 2013 to 2019, considering 2012 as the base year. 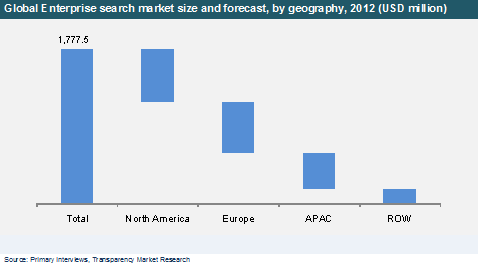 In terms of geographical distribution, the global enterprise search market has been classified into four regions namely, North America, Europe, Asia-Pacific and Rest of the World (RoW). This section includes market revenue (2011-2019) and forecast (2013-2019) for end-use industry and size of enterprise in each regional market, in terms of USD million. The study further offers recommendations and highlights of the market, which would be useful for the present and new market players to sustain and grow in the global enterprise search market. The report concludes with the company profile sections which include key information about the major players in the market. Some of the key players profiled in this report include IBM Corporation, Microsoft Corporation, Oracle Corporation, SAP AG, Attivio Software Incorporation, Coveo Corporation, Dassault Systems S.A, Marklogic Corporation and X1 Technologies Inc. This study includes the strategies adopted by these key players to sustain competition. Recent developments by the companies and barriers of the market will help emerging players design their strategies in an effective manner. The study is expected to help key players of the enterprise search market in formulating and developing their strategies.